Always open to forming strategic alliances, Hip Hop Vibe recently teamed up with Jax City Entertainment, based in Jacksonville, North Carolina. An overlooked hotbed for hip hop filled with untapped talent, Jax City Entertainment has teamed with Hip Hop Vibe to provide an outlet for the local artists. 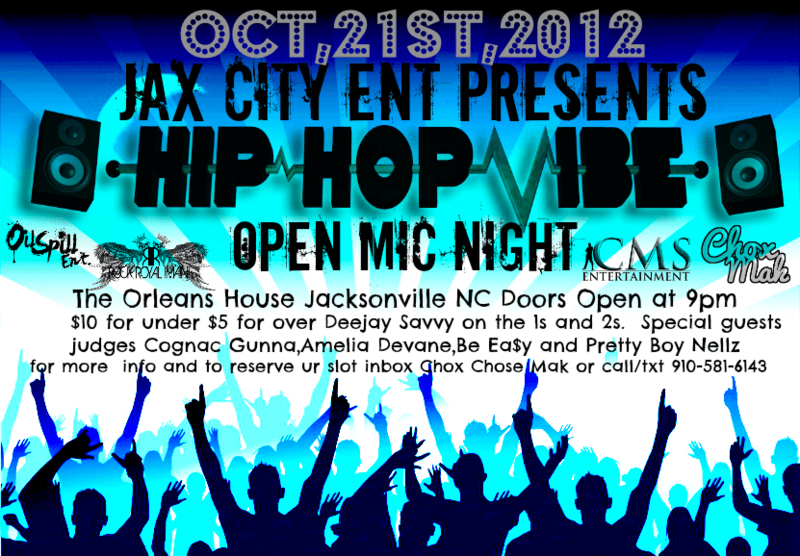 Independent artists in the area are welcome to come to the Orleans House in Jacksonville, North Carolina to perform. The event will be hosted by Chox-Mak, meanwhile Cognac Gunna, Hottie of the Week alum, Amelia Devane, Be Ea$y Wilson, and Nelson Davis will serve as judges for the event. The judged winner of “Hip Hop Vibe’s Open Mic Night” will be featured on Hip Hop Vibe and will receive one month of regular radio rotation on Burdskool Radio.